The building is a 2 storey non-conservation shophouse along the busy Bukit Timah Road. 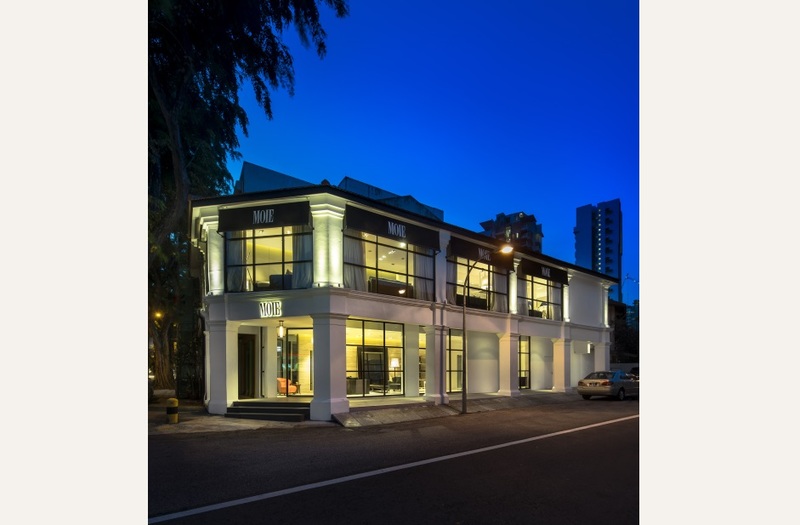 The previous building facades were in pseudo classical treatment which did not blend well with the look and feel of the high end and exclusive furniture showroom, and the interior of the existing shophouse did not have spatial highlight in the interior. The design introduced a double volume via opening up a portion of the existing 2nd storey floor slab and changing the facade via enlarging the fixed glass windows so that more natural lights can enter the building. The interior of the building is designed by Topic Design Studio Pte Ltd, introducing natural materials into the interior such as full travertine walls, walnut flooring and leathered padded soft wall panels to act as a neutral backdrops to the furniture display. Architecture and Interior are meant to be a setting to bring out the characteristic of the furniture, harmonizing and blend.